As a homeowner, you’re probably aware of how important it is to maintain your home. Cleaning gutters, trimming shrubs, evaluating your heating system – these are just some of the many important tasks you need to keep up on. But knowing when and how you need to check up on the different things in your home that need upkeep can be difficult to do, and before now, there was no easy way to keep taps on it. 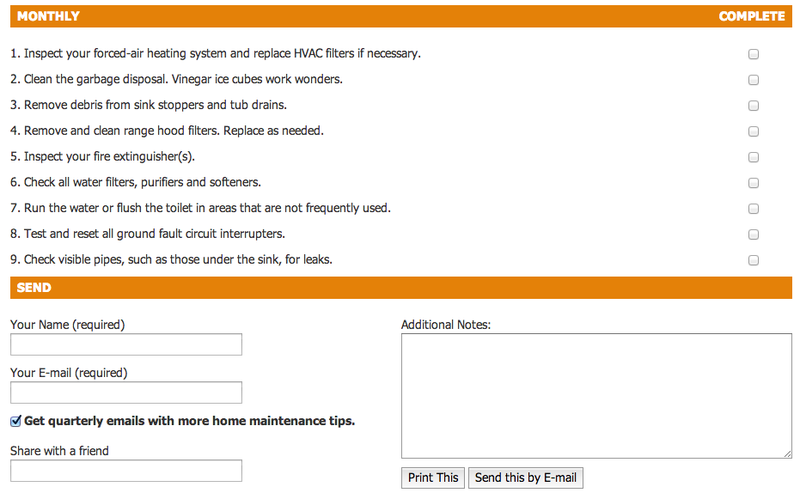 To help solve this problem, we created an interactive home maintenance checklist with a calendar reminder function. Every three months, you can get a reminder through email with the most important things you need to check up on. This way, you won’t forget about an important detail that could end up costing you. Although the email function is one of our favorites, the checklist is also a great standalone bookmark that you can come back to keep track of the current state of your home. Whether it’s spring, summer, fall or winter, we’ve got a checklist to run through the most important “to-do’s” as it comes to home maintenance for that season. Check them off, email yourself, or even send to your loved one to let them know that yes, they should probably clean out those dirty gutters. Although we feel pretty good about the checklist, we’re always open to ideas for how we could improve it, or potential checklist items we might have missed. Please email our developer, Ross, at ross@choicehomewarranty.com, if you have any other suggestions or ideas for the checklist. If not, we suggest you get to it and start using the home maintenance checklist today!